Several rumors suggest that the Samsung Galaxy Note 9 has a fingerprint scanner under the screen. It probably does not stop there according to a new patent. The camera and iris scanner of the flagship is perhaps also behind the AMOLED display. 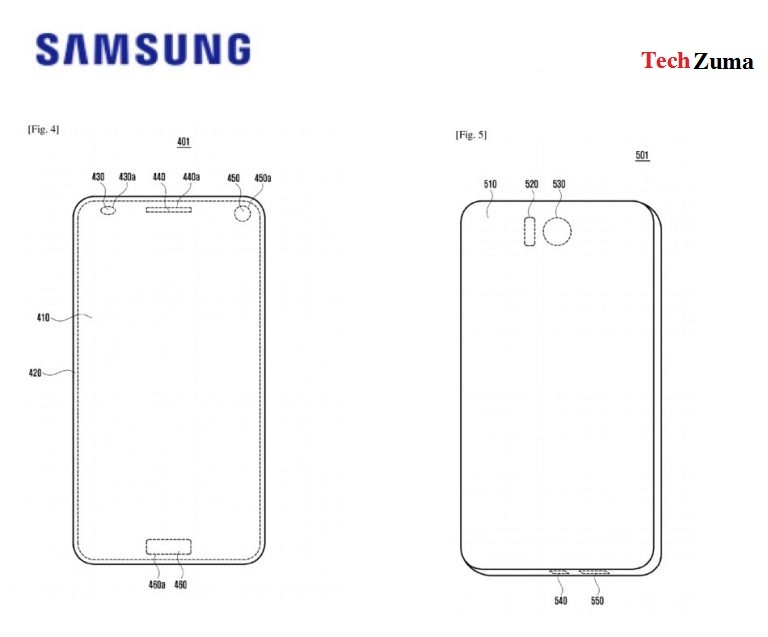 A new patent from Samsung shows an exciting technique for future smartphones. While the displays have become much more extensive in 2017 thanks to the slim bezels of full-screen smartphones, the optimal size is of course 100%. The new patent from Samsung shows a smartphone with a display that occupies almost 100% of the entire front. 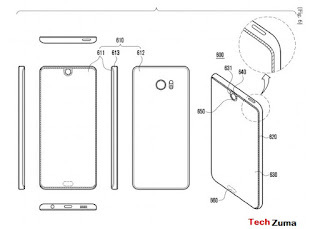 The patent implies a fingerprint scanner under the screen and even the camera and iris scan sensors under the screen. With this technique, the edges of the Samsung Galaxy Note 8 flagship are minimized. Today WIPO has published a new Samsung patent ( WO2018012719-PAMPH-108). 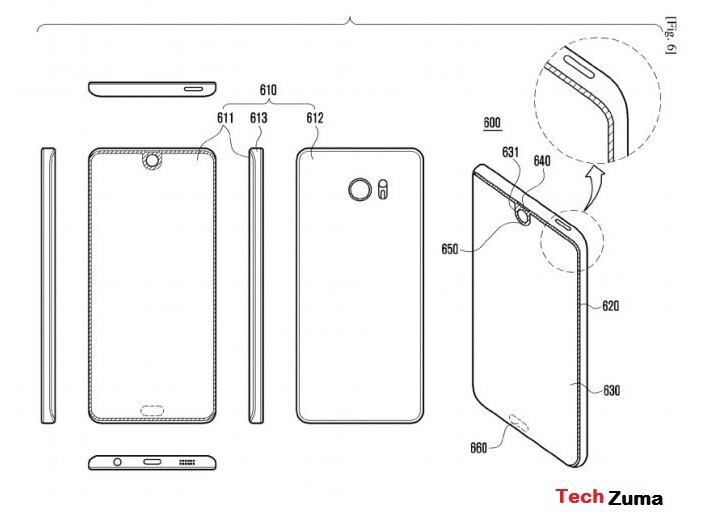 The patent also shows an alternative where the screen occupies practically 100% of the entire front. There is only room for the single sensor on the front similar to the Essential Phone P-One. According to various exemplary embodiments, the optical sensor 430, the receiver 440, the camera 450, and the fingerprint sensor 460 may, for example, be connected to the housing 420 or the lower part of the display screen 410 (e.g., backside of the display screen 410). For example, the optical sensor 430, the receiver 440, the camera 450 and the fingerprint sensor 460 may be included in the display 410. The optical sensor 430 may, for example, comprise a proximity sensor, an exposure sensor, an iris sensor or a UV sensor. 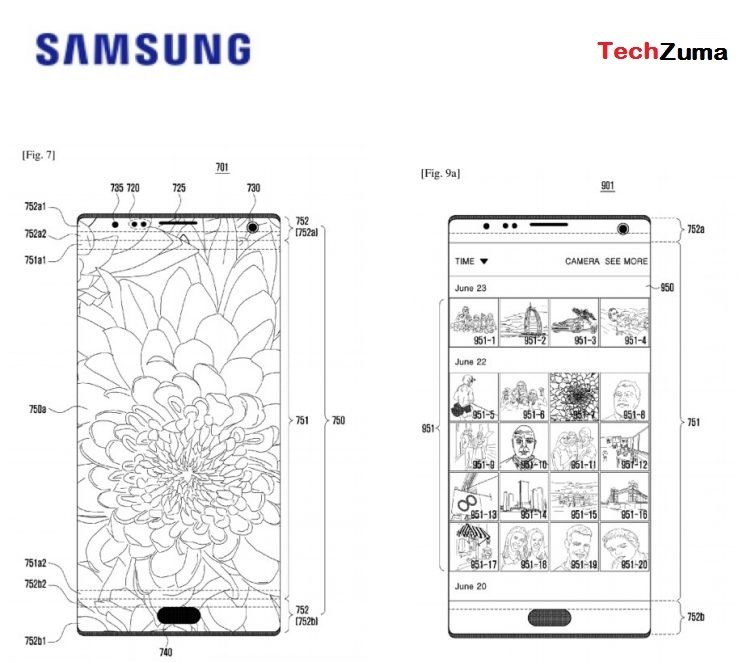 The Samsung patent shows a flagship device with the shapes of the Samsung Galaxy Note 8. Presumably, we see here a concept of the Samsung Galaxy Note 9. The smartphone has a huge screen and flinter thin bezels (edges) on the bottom and top. We see in the image below that the device has a fingerprint scanner on display. The other sensors that you see with the Galaxy Note 8, for example, are also included in the screen. The large screen runs past the selfie camera and iris scanner. The display ratio will probably be higher than the aspect ratio of the Note 8 and the Samsung Galaxy S8(18.5: 9). Perhaps at the end of this year, we will see the first smartphone with an aspect ratio of 21: 9. This mega display will have a resolution of 3,360 x 1,440 pixels. The new patent from Samsung shows another method in which the screen occupies practically 100% of the entire front. The images show a Samsung Galaxy S9 look-a-like that is equipped with a large screen with a node for the selfie camera. We have already seen this design on the Essential P-One smartphone. This model also has a fingerprint scanner under the screen. Striking is the speakers that are not placed above the screen but at the top right of the housing.